A “DND During Bedtime” feature will keep your display clear during the evening, so you don’t look down at your phone in the middle of the night and see a zillion notifications. Now with Do Not Disturb you can also set a time limit, so that DND ends in an hour or at the end of an event, so you don’t accidentally leave it on. With the new OS, you’ll be able to turn off notifications for apps you don’t want to deal with from the lock screen. 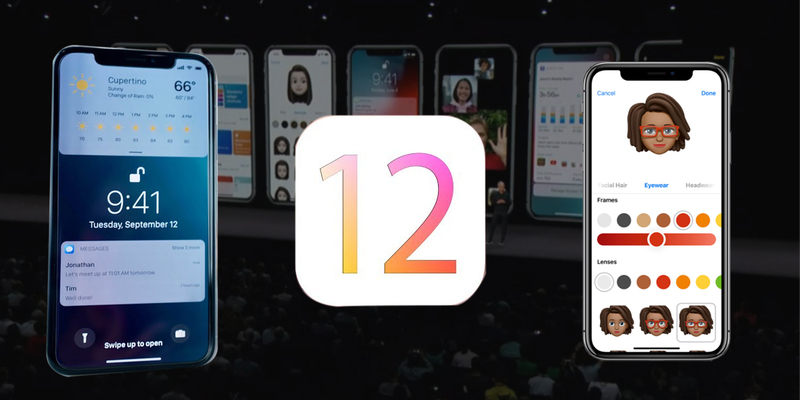 iOS 12 is also bringing support for grouped notifications. Notifications can be grouped by the app as well as topic and thread. For instance, all your calendar notifications will be stacked on top of each other and you can dismiss them at once. A new feature called Screen Time will offer weekly reports about your iPhone. This will include information on how much time you’ve spent on Twitter or iMessage, as well as what apps are sending you the most notifications. If there’s an app in your activity report where you’d like to spend less time, you can set a limit. When you’re about to hit your limit, on say, Instagram, you’ll get a note letting you know you only have a few minutes left to use it. Once the limit is reached and you open the app, another message will pop up reminding you that you’ve already used your maximum allotted time, though you can always choose to ignore it. It’s an interesting feature that helps Apple to position itself as an ally in the fight to reclaim your time. Revamped performance- Apple is working to make iOS feel faster than ever — particularly on older iPhones and iPads. Federighi said that in Apple’s tests on an iPhone 6 Plus, apps launch 40 percent faster, the system keyboard comes up 50 percent faster, and opening the camera is 70 percent faster. Apple is working to speed things up for the full range of devices supported by iOS 12. The company is also focused on times when devices are under heavy load; iPhones and iPads will now be better than ever at delivering optimal performance while also prolonging battery life. Desired Screentime- Like Google, Apple is trying to help users strike a better, healthier balance between gadgets and life. A new Screen Time feature in iOS 12 will detail how much time you’re spending on your device and using individual apps. It can break down app usage by category and track which apps are sending you the most notifications. Screen Time will provide a weekly summary of your usage habits. Similar to Android P, you’ll be able to set time limits for each app. iOS will automatically notify you when you’re running out of the allotment of time you’ve given to each application. A “time’s up” message will display when the counter runs out. If you want to continue using that application, you can simply request more time. Apple is also applying this abundance of usage data to parental controls, giving parents greater oversight and supervision over how often their kids are staring at a screen. Intriguing Animoji has come up- The roster of Animoji characters that first debuted with the iPhone X is expanding again with a ghost, koala, tiger, and tyrannosaurus rex. And starting with iOS 12, Animoji will be able to detect when you’re sticking out your tongue and mimic that. It’s time to embrace Memoji as well- But the bigger advancement around personalized avatars is what Apple calls Memoji. In iOS 12, you’ll be able to create characters that have your own appearance, choosing skin color, hairstyle, and outfitting your Memoji with accessories. It’s like a cross between Bitmoji and Nintendo’s Mii characters. Samsung introduced something like this with the Galaxy S9 to mixed reviews, but Apple seems to have put a lot of work into Memoji. Facetime for groups- Apple’s video chat app will soon be capable of hosting more than one-on-one conversations. iOS 12 will introduce group FaceTime sessions that can include up to a staggering 32 people. Group FaceTime will be supported across iOS and macOS. When multiple people are on a call, their video windows will get larger when they’re speaking and shrink when they’re not. And for conversations where your face feels a little boring, you’ll be able to use Animoji and Memoji characters during calls. ARKit 2 peeps in- Apple is trying to own the conversation around augmented reality and establish iOS as the platform that’s leading breakthroughs for the unique, mixed world experiences that AR makes possible. The company is updating its ARKit framework and giving developers the ability to create shared experiences; two users on different iPhones can see the same thing when running the same app. Panacea Infotech is a leading iPhone development company in USA aiming to take innovation to the next level and transforming the business across the globe through its first-rate app development skills. The exclusive tools and solutions we provide have always been of a great help to all our clients who wanted to enter the dynamic marketplace and improve their products as well as services in the manner.